"ARCO" - an alliance of two of Australia's most loved and respected classical musicians, Richard Price and Ashley Arbuckle. Arco, in musical terms, means “Bow” – a fitting name for this exciting and unusual duo. Separately, their extraordinary talents have taken them all over the world, performing with some of the most acclaimed orchestras known. 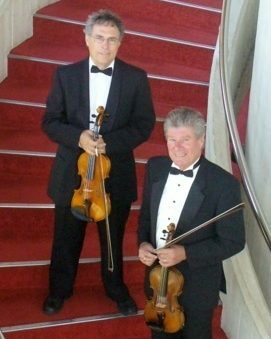 After performing with both the Tasmanian Symphony Orchestra and the Queensland Theatre Orchestra (as Co-Concert Master), Richard played as a member of the Lucerne Orchestra, the Zurich Chamber Orchestra and the Aargauishes Symphoniker Orchestra. Once in Perth, Richard performed with the Raymond Long Orchestra and Douce Alliance which featured in the 1988 Centenary, 1989 PIAF and York Jazz Festival. Richard is featured as a guest artist on the Rob Hyner Trio’s album “Confluence” and “Blame It On My Youth”, which also features Ashley Arbuckle. Ashley joined the WA Symphony Orchestra soon after graduating and was later appointed to Associate Concertmaster. He spent many years in London, where he was appointed Co-leader of the Royal Philharmonic Orchestra. In 1981 he was offered the position of Co-leader of the London Symphony Orchestra, a position he held for 10 years. Whilst in London he was also a member of the St Giles Quartet, the Yehudi Menuhin Festival Orchestra and a founding member of the Australian Sinfonia of London. He has worked with Leonard Bernstein, Frank Zappa, Dame Kiri Te Kanawa, Jesse Norman and Michael Oldfield (Tubular Bells). Ashley was also invited to be Guest Leader of the BBC Welsh Symphony. In 1995 Ashley was the only Australian musician invited to join Sir Georg Solti’s World Orchestra For Peace as part of the celebrations for the 50thAnniversary of the United Nations in Geneva. Together, this phenomenal duo, Arco, perform to their own backing tracks for smaller and more intimate functions, or with their 14 Piece Chamber ensemble “ElectriClassics” for a sensational sound. Drawing on their mutual love of classical, rock and jazz they create an experience that any lover of music will revel in.